Making Dining Easier With Crypto. Small & quick transactions, like required in restaurants and bars, are not realistic with Bitcoin or Ethereum due to huge price fluctuations, long transaction times, and high fees. The Bitcoin network isn't ideal for these type of transactions and the prior knowledge required by the business owner limited its reach to technologically advanced users only. MenuBuzz radically changed this by offering businesses a simple interface for their diners to order and pay with crypto which is converted and deposited into the merchants account in dollars. Now the business owner doesn't have to understand what a blockchain is in order to accept cryptocurrencies. Exceptionally simple, but powerful in its simplicity. MenuBuzz accomplishes this through their utility token aptly named MENU. MENU Tokens are vouchers redeemable for food & beverages via the MenuBuzz website. Similar to digital gift cards, MENU Tokens are prepaid and can be exchanged or gifted to anyone else. 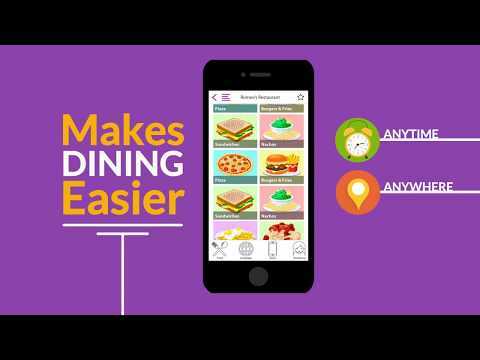 MenuBuzz sallows the platform’s users to order from their own smartphones while in the restaurant. Now users can order and pay from their own devices on their schedule, saving time and money. MenuBuzz makes servers more efficient by allowing the customers who don't wish to wait for a server to be able to order themselves from their own device. This not only makes servers more efficient, it also increases sales. With labor costs increasing, MenuBuzz empowers servers to be more efficient so restaurateurs can afford to retain the best. MenuBuzz accelerates widespread crypto adoption enabling their usage in perhaps the most popular, everyday transaction: the purchase of food and beverages. Restaurants and bars are not required to be holders of a cryptocurrency wallet because the Menu Tokens that are spent in the restaurant are immediately and automatically converted into fiat currency for them. MenuBuzz is a off-chain solution that takes the burden off the blockchain for smaller sized purchases. Customers need to fund their MenuBuzz wallet before they can make purchases. They fund their wallet through a variety of methods including Bitcoin, Ethereum, or MENU.Once their wallet is funded they can choose to purchase food and beverages through participating merchants or they can withdraw their tokens to their wallet. The benefit of using an off-chain wallet is there are no customer transaction fees for each purchase, transactions are instantaneous, and it doesn’t slow down the main network with a lot of small purchases. Customers pay the blockchain associated fees to transfer to and from their wallet but they don’t pay any transaction fees on MenuBuzz. As with any good Loyalty Program, rewards are coveted and bring benefits earned by the customers participating. In the MenuBuzz Loyalty Program, customers who pay with crypto receive a percentage back in for future purchases at any of restaurants in the MenuBuzz network. Key founders did not complete the KYC process. Serious flag and warrants remedial action. If the team responds, I will be willing to improve the rating after KYC passed. This make no sense whatsover. there are too many products out or coming out in this crowded space that translate cryto to fiat on a pos system or chip and pin. Nothin special here.also there has been little or no effort in engaging the community. No kyc conducted. If KYC's submission has not been completed, investors are not interested in this project. I understand that they are trying to challenge a very interesting project, but I disappointed in this project. Once they are ready on this site, we will review the evaluation. 1. Would like to invite the CEO and CLO to undergo the ICOBench KYC. 2. I may revise my ratings after receiving point-by-point answers Douglas's concerns in the above review & the KYC. Nowadays it isn't enough to make a beautiful website and promise something in the future. As the members didn’t bother to answer the KYC invitation, this project gets its first red flag. These members don’t even mention their affiliations to this project in their LinkedIn profiles. Are they embarrassed to do it? Just another crypto-embellished payment app to compete in this already crowded niche. By relying on common assumptions and misunderstandings about blockchain technology, MenuBuzz complicates user’s life by demanding it to have to hold and operate a cryptocurrency wallet. Launch Android Build on Google Play. Launcj iOS Build on iTunes.